This is the sixth part of a new blog series from Dr. Palmer on the topics featured in his new book Self-Control or State Control? You Decide, which can be downloaded for free here. People raised in different circumstances often show different attitudes toward potential dangers. If you’ve never been near the water or learned how to swim, lakes, rivers, and oceans probably seem quite terrifying. Those who can swim generally see rivers, lakes, and oceans differently. Such different experiences may lead to different policies regarding access to water. We can forbid people to go near the water, or we can help people to acquire the habits of self-control that reduce the very real dangers posed by bodies of water — and swimming is all about self-control, rather than merely thrashing about. There are parallels with other potentially dangerous things, as well. Freedom increases self-control and reduces harm. When you acquire the habit of self-control, fear doesn’t simply disappear — and, in the cases I’ll discuss, it shouldn’t disappear, but it may turn into respectful caution based on knowledge. I think my parents understood some things about the relationship between freedom and self-control, so I’ll draw on my own experiences growing up. When I was a small boy, I watched my mother smoke and thought it was a pretty cool thing to do. In fact, there can be some elegance in the habit. At the same time, there’s little doubt that inhaling smoke can be very harmful to one’s health. My mother had come as an adult to understand the second point. I recall rather vividly — one of my few vivid memories from that time — my mother watching me watching her smoke. I think I might have been six years old. She then asked me if I wanted to smoke, to which I replied, “Yes!” She said that I could smoke if I wanted and she lit up a cigarette, told me to draw it deep into my lungs, and handed it to me. After that experience, for some reason (you can guess), I somehow never developed an interest. As a teenager, I tried to smoke cigars a few time and just couldn’t do it. My mother understood that “forbidden fruit” are far more delicious than permitted fruit, and she helped me and my brothers to avoid that habit by offering us our freedom — and memorable negative experiences — at young ages. I’m not saying that such a strategy will always work with everyone and everywhere, but it seemed to have worked with us. Smoking wasn’t forbidden, and, at least partly as a result, it just didn’t seem attractive. Alcohol was treated similarly in our home. It wasn’t hidden in a locked cabinet. As a child, I was allowed to ask for a very small glass of wine or beer at meals if adults were drinking and I expressed an interest. As a result, having a bit of alcohol didn’t seem so exciting, and I think that helped me to lead a fairly temperate (but not tee-totaling) life. Yes, I did have some memorably bad experiences with alcohol when I went out on my own as a teenager, but that’s not all that unusual. Read: What happens when your responsibility is stolen from you? Moreover, in Germany and Austria the 16- and 17-year-olds walk or take the streetcar or bus back home, because they don’t get driving licenses until they’re 18. In the United States, because teenagers can drive at 16 but not drink legally until 21, many sneak alcohol into their cars and drive to where they’re less likely to be around adults. That should sound like a bad combination from the start. There are reasons to believe that the U.S. system encourages more young people to do more unsafe drinking, often involving driving. I know thoughtful and well-meaning people who are terrified of handguns. They look at a gun on a table like most people would look at a poisonous snake, coiled and ready to strike. They’ve never been around firearms to learn firsthand just how dangerous they are; if handled properly, they can be useful, and if handled improperly, they are very dangerous, indeed. In that respect, they’re like automobiles, which are heavy killing machines if handled improperly or — as happened recently in the French city of Nice — malevolently. In contrast, I was raised with firearms in the house, in the holster, over the shoulder, in the purse, and in the glove compartment. My mother and her mother carried firearms. As my mother used to tell me when I was a boy, “God created men and women, but Colonel Colt made them equal.” She was never afraid, but she was also never careless. She and my father taught us that firearms are not toys, and that they are extremely dangerous if mishandled. We learned the rules of handling firearms from a young age, and we respected them. When I qualified for a marksmanship merit badge at 13, my mother was very pleased and proud. A major part of that merit badge was learning to use a firearm responsibly and safely. We were taught that every firearm is always loaded, regardless of what you believe or have been told; that you never point a firearm at anything you don’t want to destroy or kill; that the finger never touches the trigger unless you intend to discharge it (and destroy or kill something); that one must always be aware of what is near or behind one’s target; and so on. Those rules were ingrained in us. My brother is an excellent teacher of gun safety, and he always starts with those rules. I have introduced visitors from a number of other countries to him, and from him they learned: first, how to respect the dangers of firearms and to handle them safely; second, how to use them safely; and third, how to clean and care for them and store them safely. Read: Do their passions forge their fetters? People with that kind of knowledge, based on the freedom to keep and bear firearms guaranteed in the Second Amendment to the U.S. Constitution, fear them like other people fear automobiles. When used improperly or malevolently, they are very dangerous, indeed. When used properly, they can be very useful. I’m alive today because I had a firearm when I was attacked; I’m very grateful to my mother for having given it to me so I would have it when my life depended on it. There is a robust debate and a voluminous literature on whether restricting the right to keep and bear arms leads to more or less crime. The causes of crime are complex, and increases or decreases might be caused by economic, demographic, juridical, or other factors. I can’t really add substantively to that debate, except to note that there is little or no reason to believe that restricting the freedom to acquire firearms leads to less crime and serious reason to doubt that increasing that freedom leads to more crime. The bulk of the increase in homicides in the United States can be traced to the early 1970s launch of the “War on Drugs,” which also contributed to America’s massive prison population. 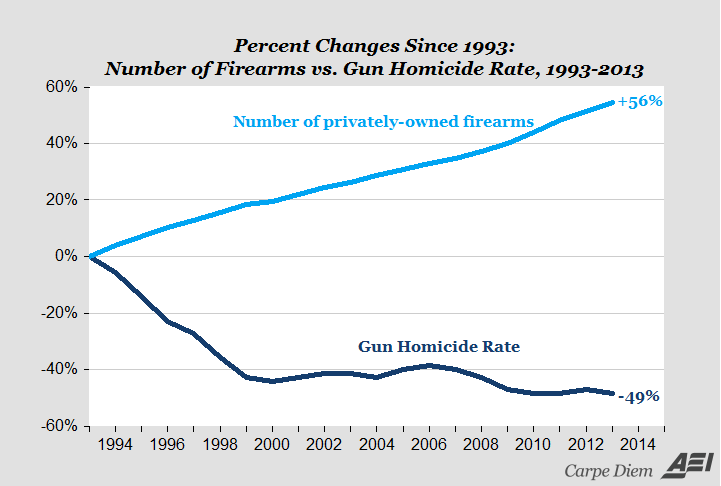 What accounts for the declines since 1993 is not entirely clear, but the fact that those declines corresponded to liberalization of laws governing the ownership and carrying of firearms, as well as substantial increases in the number of privately held firearms, suggests that claims made by the opponents of legal gun ownership are shaky, at best. Statisticians may (and do) dispute causal claims, and I’m cautious about making them. But one form of causation seems inescapable. At the end of the day, the key to a good life and a good and orderly society is self-control, and self-control is a product of freedom.